Through the late 1820s and into the 1830s James Webber expanded Tocal to 3,300 acres and earnt the reputation as a progressive farmer. Then in 1834 he sold Tocal prior to leaving NSW. James Webber expanded his land holdings beyond Tocal, acquiring several other blocks, the largest of which was 2,560 acres on the Paterson River at present-day Lostock. He called this grant Emral and much of it now lies beneath the waters of Lostock Dam. 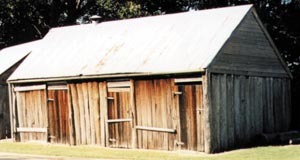 Right: Tocal's blacksmith's shop, probably built in Webber's time, would have been a hive of activity as the estate expanded. Webber took an active role in local and colonial activities . He was appointed a magistrate and Justice of the Peace. As a magistrate his services were in demand from neighbouring landholders requiring punishment for uncooperative convicts. James Webber at times ordered 50 lashes, a common penalty at the time, for convicts who refused to work, were insolent or absconded. Above: Record showing James Webber ordering convict Patrick Connell to receive 50 lashes for neglect of work. James Webber was a foundation member of the Agricultural Society of NSW formed in 1822, and chairman of the local Farmers' Club. In March 1834 Tocal was advertised for sale - Webber had decided to return to England and Europe. Sydney merchants Caleb and Felix Wilson purchased Tocal for 2,600 pounds in August 1834. James Webber received a public farewell dinner in Maitland in January 1835 and later that year sailed from Sydney, arriving in England in July 1836.